Regional Cooking from the Heart of Mexico recipes cookbook. Rick Bayless is considered the Master of authentic Mexican cooking. Here�s an obvious classic in cookbooks, with its beautiful and helpful illustrations, informative Cook�s Notes and wonderful assortment of authentic recipes. Start with the basics and learn how to make your own tortillas, Chunky Guacamole, and Pickled Chilies With Other Vegetables. Or how about homemade Tortilla Chips? Choose from an assortment of Tamale and Mole recipes, including fun snacks made from traditional corn masa. Entres include down-home dishes like Chile-Bathed Fish Grilled in Cornhusks, Red-Seasoned Chicken Steamed in Banana Leaves, and Savory Golden Country Ribs with Avocado Relish. Of course you will need side dishes and there are plenty to choose from in the Rice, Beans and Vegetables chapter. The White-Rice Pilaf with Corn, Roasted Chiles and Fresh Cheese and simple basics like Refried Beans are just a few of the choices. Anyone for dessert? How about Buttered Crepes with Caramel and Pecans? Or Custard Ice Cream with Cinnamon and Vanilla? The chapter containing drinks holds intriguing concoctions like Masa-thickened Hot Chocolate, Lime-Zest Cooler and Fruit & Milk Smoothies. The Glossary of Mexican Ingredients and Equipment at the back of the book is loaded with more beautiful illustrations to accompany the very useful information. A must for your kitchen and a wonderful gift. Cocina Mexicana Regional Aut�ntica del Coraz�n de M�xico. Libro escrito en ingles. Rick Bayless and his wife spent years living in Mexico travelling to all of the states to find out what authentic Mexican cooking was in each area. The book uses that knowledge to cover basic ingredients and preparation techniques and give you several interesting takes on the subject from several different regions. For example, he tells about his adobe recipe he developed while living in Oaxaca that he made with the help of his butcher and then and the next pages talks about Yucatecan seasoning pastes. 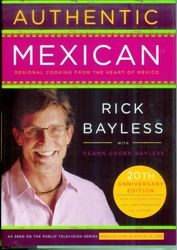 I love Rick Bayless so wanted to give this cookbook to a friend for Christmas. Big hit!